Zinifex announced yesterday that its Rosebery mine, on Tasmania’s west coast, will be significantly expanded and extra exploration effort will be put into discovering new zinc deposits in the State. 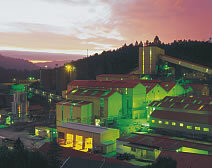 Zinifex has agreed to a joint-venture deal with Umicore to hive-off its Hobart smelter. The new entity will become the largest zinc-smelting and refining operation in the world, responsible for producing ten percent of all processed zinc. The move will also allow Zinifex itself to focus entirely on zinc mining and exploration. The Zinifex mine at Rosebery produces 150,000 to 180,000 tonnes of ore a year. There is a world shortage of zinc and Zinifex, which is the largest exploration leaseholder in Tasmania, will focus on finding new ore bodies in the area between Queenstown and Waratah. This news item is presented as being of general interest on the state of economic development in Tasmania. It is not intended as investment advice. The author and the owners of T CHANGE do not hold shares in, nor do they derive any benefit whatsoever from the company/companies mentioned in this report. See also related news item on demand for women to fill mining industry jobs. There are substantial high-grade mineral deposits in Tasmania.